While reading through the Backpacker.com forums today I came across a thread that linked to “an ultralight chimney kettle.” Curious as a cat, I clicked the link and it brought me to a blog called “the boilerwerks.” The product at hand is Devin Montgomery’s pride and joy, The Backcountry Boiler. A few months back I decided to try out a homemade wood burning stove. To make a long story short, it did not turn out the way I had hoped for when I set out to build the stove. Besides the fact that it didn’t turn out like I had planned, I also found that while using wood burning stoves I ended up with sooty pots and stoves left with ashes inside them. Basically it was a mess, especially since I would have to load it all back up inside my pack with everything else after I was done using it. However, I did have fun building it! But, all of these things kind of turned me off to the idea of a wood burning stove, so I have not really pursued that route since then. What I found on the boilerwerks has altered that thought process, at least slightly. The Backcountry Boiler is a little different from a typical wood burning stove, even though it is one; however, wood is not the only fuel source that has to be used in this “chimney stove.” Basically, if it burns, it can be used, that is if you can break it down small enough to fit inside the stove. As far as how it works, by looking at it, I have thought of it as a wood-burning Jetboil. The stove (or fire bowl) is found at the bottom and the kettle fits directly on top of the stove (such as the Jetboil). The cool part is the actual kettle. The kettle is round but has a hole that goes all the way up the center of the kettle which is where the flame from the fire breathes. As the fire burns under the kettle and through the center, the water contained inside the kettle quickly boils. What really interests me about this is that it looks like it would not be that messy at all. By design, the fire bowl would be simple enough to empty all of the ashes from after use, and then to simply wipe it clean. 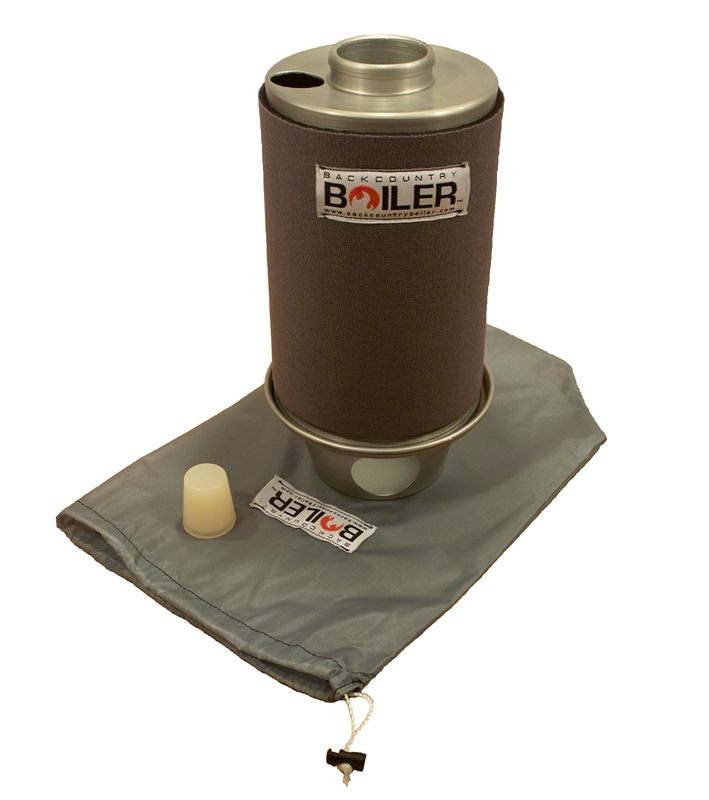 As well, the soot would be mainly confined inside the middle of the kettle so it would be hard to get all over everything, especially inside a stuff sack. Oh, and did I mention that the basic set-up is only about 8 oz (less than 10 oz with all the accessories) and has a capacity of 20 oz? Not too bad at all! This entry was posted in Cook Kits, Gear, Stoves and tagged Backpacker.com, chimney kettle, forums, the backcountry boiler, wood burning stoves. Bookmark the permalink. I made my own woodgas stove today and gave you and Heber shout outs in my blog. Take a look when you get a minute. Devin, Hey no problem man. Glad you not only met, but exceeded your goal! I am looking forward to seeing you make more of these though because eventually I want to get one of my own. I just bit the bullet (merry Christmas to me) and bought the cheaper version, without the stuff sack, plug & neoprene cosey. It won’t arrive until sometime in January but I’ll blog about how it works the first chance I get! Mike & Heber, thanks for checking out my blog. Also, I am glad that I could point y’all both to Devin’s site. This is the first that I have seen or heard about his site or this cooking set-up. I am really excited to see him evolving his “business.” I hope he does well, so thanks for checking it out and helping him along. Been enjoying your site. Lots of great information and pictures here as well! Once I tried alky stoves I never wanted to go back to my canister stove. Up to this point I have not been a fan of wood burners, but I there is one to change my mind I would say this would be the one. Sadly, I cannot get one at this moment but plan to do so in the future. Just found your blog. I’m glad I did because I had heard about this boiler back when it was in the planning stages but didn’t know he had proceeded on to make a production run. I just placed a pre-order today.